For some reason, beginning with Windows Vista, Microsoft left the “Copy to” and “Move to” functions off of the Windows right-click menu. So this is for all of you who have Windows Vista, Windows 7, Windows 8x and Windows 10. Yes dear readers, we have tested this in Windows 10 Home & Pro and it works, I tells ya! Those of you who have installed Windows Vista have probably noticed that the right-click menu is quite different than it was in previous versions of Windows. One of the features we like the most, the “Move to” and “Copy to” menu items don’t appear by default in Windows Vista or Windows 7’s right-click menu. Why not? We don’t know, ask Uncle Microsoft. If you’ve ever wanted to move a file from, let’s say, Drive C to a folder on a flash drive, you could open up two Windows Explorer windows and drag and drop the file, but this is a lot of unnecessary rigmarole. Wouldn’t it just have been easier for the Windows Vista brain trust to have put “Copy to” “Move to” selections on the right-click menu? Indeed. But, they didn’t. All of you who read this newsletter have learned that easier is often better. So you will love this trick. Right click on this link, choose “Save” “Save link as” or “Save target as” and save it to your desktop. Unzip the file to a folder and right-click on one of the two files inside the zip then choose “Merge”. You’ll get a warning that you’re about to enter information into the registry. You can either trust us and allow the registry info to be entered and then you’ll have “Move to” or “Copy to” items on your right-click menu depending on which file you chose. After you’re done with the first file, do the same with the second file. After you’ve finished you’ll have “Copy to” and “Move to” displayed on your right-click menu whenever you right-click on a file. It makes it easy to move files from one location or another. 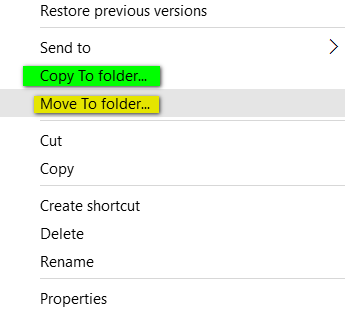 You can copy or move multiple files by holding down the CTRL key while you select each file you want to move, when all files you want to move or copy to another location are highlighted, right-click one of the selected files and choose “Copy to” or “Move to” from the right-click menu. Tried and tested in Windows Vista, Windows 7, Windows 8x and Windows 10. Works on 32 bit and 64 bit Windows. Done, thanks for the tip. When I right click to open one of the two files in the folder I do not see a merge. I see open and a list of things including copy to and move to. When I click open I see the warning. Should I click open and then accept the do I want to do his warning? I also cannot see the word “Merge”. Why? When I right click on either copy to or move to file I don’t see ‘merge’ only cut copy delete and properties. If I left click I get a security warning about running software with no digital signature or unknown publisher. I see no “Merge” either. You’re missing context menu items – just double click on the reg file – that should work as well. Double Click on the reg file to merge it. You’re missing some context menu items if you don’t see “Merge”. Excellent, works fine [Windows 10], was much missed. Thanks for the return of copy to and right click. You both are the greatest. Thank you very much for a much needed old favorite set of commands. Great work! Brilliant – simple to do and the commands are there. Thank you!